When it comes to curtain decor, the rods matter as much as the drapes that hang from them. And so do the finials at the ends of the rods, and the wall-mounted tiebacks that hold back the curtains when you want to let in the light or the breeze. The drapes are generally what attract the most attention, but it is the drapery hardware that frames the color and motion of the drapes. So next time you are redecorating the windows and changing the curtains of your rooms, take some time to choose the drapery hardware well. The Decorative Hardware Studio is here to provide you with all the options you’ll need. 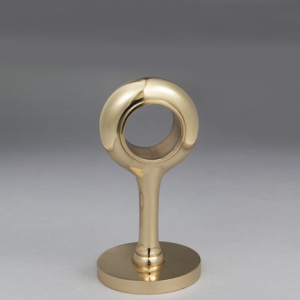 In our inventory you will find a wide assortment of exquisite, custom brass holdbacks, finials and curtain brackets, as well as quality tubing and curtain rods. 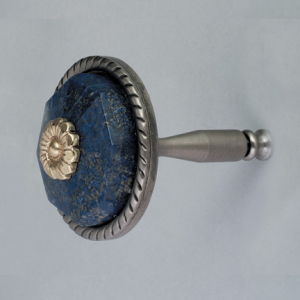 If you are going for a lighter, or more color-filled look, you will find matching drapery hardware in our collections of gemstone and glass floral holdbacks. These are elegant colored glass holdbacks and holdbacks with imbedded semiprecious stones, which come in a variety of shapes and designs. 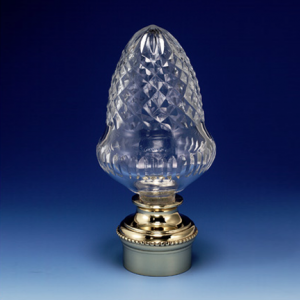 You will also find glass and leaded crystal finials. So no matter what design idea you are working with, we’re sure to have a set of drapery hardware that works perfectly. 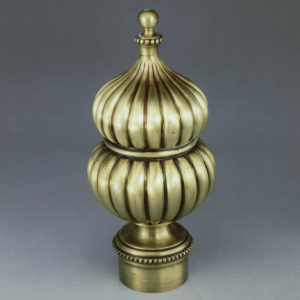 Each piece of drapery hardware is created by highly skilled artisans who specialize in English, French and Colonial styles. At DHS, we do not import products, but instead manufacture every piece of decorative hardware ourselves, and we are always there to provide you with professional assistance in customizing and installing new furniture hardware.